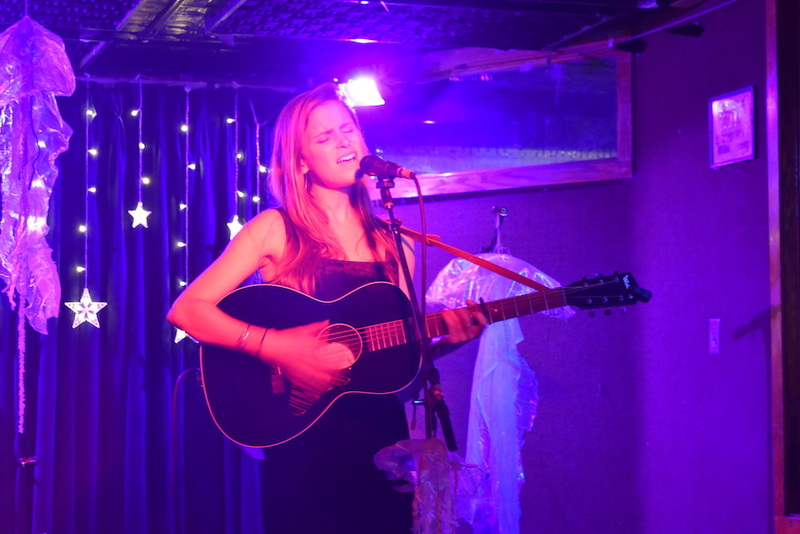 Bridgeport singer-songwriter Elle Sera opened for Lydia Luce at Cafe Nine last Tuesday night. Leah Andelsmith photos and videos. Elle Sera stepped up to the mic with a soulful vocal riff, strumming a bluesy pattern in a minor key on her guitar. She slipped into a verse combining bold, brash notes with sweet, sassy ones. Tuesday night, Sera brought “Heart Drop” and a dozen other polished songs to Cafe Nine as the opener for Nashville-based Lydia Luce, a singer and songwriter who recently released her first full-length album, Azalea. The pair played to a room of around 20 intent and engaged audience members. 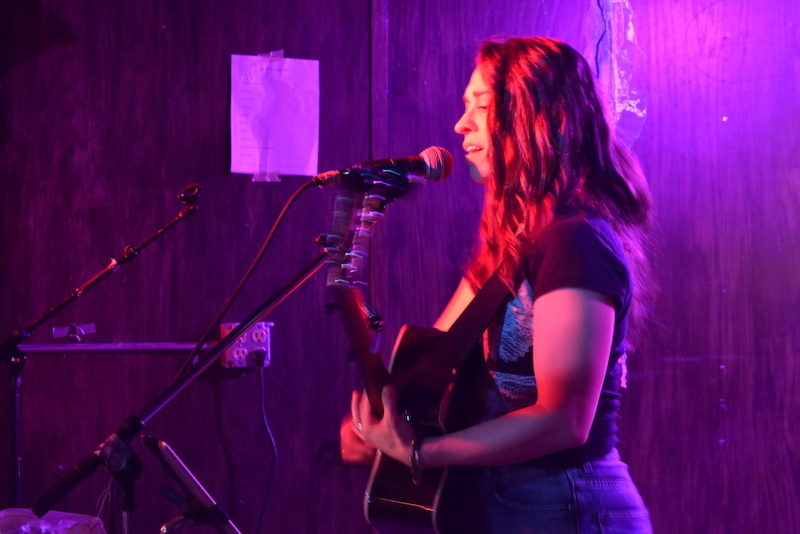 The performance was the third in a series of over a dozen shows Sera will play in across the state this month and next, including Little Pub locations in Greenwich, Fairfield, and Wilton and The Acoustic in Bridgeport. For the musician, it marks a sort of homecoming: Sera grew up in Trumbull before moving to New York City to pursue an acting career, then moved to “a sweet spot” in Bridgeport five years ago. Tuesday, she bought those years of experience to Cafe Nine. At time’s Sera’s voice is veiled; at times it’s vibrant and clear with a twang that’s bright and throaty at the same time. It’s like an unexpected mashup between Natalie Merchant and Carrie Underwood. She’s always adding these tight little blues riffs to the ends of her phrases. Singing “What We Are,” that voice was on full display. The verse hit her voice in a low, strong place in her range. She started the phrase soft as a whisper, bringing it up to a bright belting tone just a few words later, the crescendo providing an emotional pull into the refrain. She repeated the chorus again and again at the end of the song, improvising and playing with the phrasing, adding throaty flips to certain notes and sweet raspiness to others. “I love country,” she said, as if it were a guilty confession. She was less bashful when it came to loving Nashville, a city she visits often and where she says she is building up her network as an artist. It’s easy to see Sera’s Nashville influences in the way her music is polished and the way she puts her role as a performer first. Even at its most personal, she’s still delivers songs with the audience’s enjoyment first in mind. This week, she starts recording an EP slated for release in the spring. With mostly acoustic accompaniment, the overall sound of the EP will be more closely match her solo live shows, highlighting her songwriting and singing. “Sometimes production can bury that,” she said, adding that she hopes the EP will be the perfect thing for people to pick up if they want something to take home after a live show. The guitar was moody, soft but with a strumming pattern faster than the melody, giving the sense of being on a shaky foundation, or of holding back a mix of emotions. There was a soft tiredness, a broodiness to her voice; she sang with no fanfare, yet with deep feeling. There were a couple other songs like “Change of Season” in Sera’s set. Songs that she sang with a crease in her brow and her eyes far away in emotion. Songs that felt honest and stripped down, all from that same secret place in the soul. Lydia Luce played material from Azalea on Tuesday, including "Sausalito" and "Strawberry Moon." One of those songs was “Come on Down.” Towards the end of her set, Sera asked the audience if they wanted to hear one of her covers—a re-working of the Backstreet Boys’ “I Want It That Way”—or another original. The audience voted clearly for the latter with their applause and shouts of encouragement, and Sera launched into “Come On Down,” which she plans to include on her upcoming EP. There was a quietness to her performance, but also a surety. Chatting after the show, Sera explained what the song meant to her. Despite the soul-searching nature of the song, Sera never let go of her craft. She’s composed of distinct but interlocking pieces that somehow fit together on the stage: the Nashville musician performing for the audience, the singer-songwriter laying her own soul bare. The soft, brooding of Merchant, the belting twang of Underwood. The blues on one side, the rock on the other, and the country running through it all. Standing just outside of Cafe Nine’s doors, the rush of performing still keeping her warm, Sera talked about what drives her as an artist. “There’s this inexplicable universe ‘thing’ that I can’t stop,” she said, adding that she’s also buoyed by the encouragements each and every person that says they are touched by her music. “It makes me remember I’m on the right path. I’m where I’m supposed to be,” she said. She stretched out the notes, connecting them like pearls, each tone and syllable standing shoulder to shoulder with the next. Reaching into her higher register, Luce sang with open vowels, creating space and resonance in her voice. Lower in her range, she sometimes sang through her teeth, adding a grit and intensity to her smooth sound. Later, in “Wishful Dreaming,” an old-school country-inspired tune, she added touches of Patsy Cline to her singing, in the fluttery vibrato and lilting high notes. Her soft, strumming guitar cast a lullaby-like spell over the room. Luce closed her eyes and leaned her head back, lost in the lyrics. It’s a different side of Nashville that Luce is tapping into—a folk-country to Sera’s blues-country—and it’s why the two artists made such a good pairing. Sera and Luce are both accomplished singers, and as song-writers they are as deeply in touch with vulnerability as they are with their craft. But each musician takes a different route, filling in different squares in the patchwork that is Americana.